“When I saw Amy Poehler rap as Sarah Palin, with Sarah Palin sitting right there and Poehler about to give birth right that very minute, that was something,” Karbo said. Karbo’s just getting warmed up. She’s written all kinds of books — three novels, an award-winning memoir, a young-adult series about a mystery-solving girl and her pet ferret, biographies of Julia Child and Georgia O’Keeffe — but right now she wants to make another point about Poehler. “In Praise of Difficult Women” is a collection of short biographies of well-known women who are difficult in what Karbo thinks is the best sense — strong, independent, smart, assertive. The list includes J.K. Rowling, Elizabeth Taylor, Billie Jean King, Jane Goodall, Elizabeth Warren, Margaret Cho, Janis Joplin, Hillary Rodham Clinton, Carrie Fisher and Lena Dunham. Q: How did you get started on this? A: I was a huge biography reader when I was a kid, and my mother died when I was young. I was the oldest woman left in my family and I was 17. There were no grandmas or aunties or cousins who were older. I had my dad and he remarried and then I had stepsiblings but I had no women above me, so there were these women who were close to my heart who were my little internal set of household saints and personal icons … Years later I was talking to (an editor) about these women that I loved and what makes a difficult woman and it turns out there’s many ways a woman can be viewed as difficult. It basically defines any woman who is zigging when the world wants her to zag, anyone who is defying cultural expectations in a way that inconveniences people or upsets people. Q: Which has some relevance to what’s happening right now. A: If you look at the #MeToo movement, the range of sexual misconduct is very broad. People have misgivings, sometimes rightly so, but they say “Oh, she shouldn’t have said that about this guy because he lost his job,” as if that was her decision. That was management’s decision. She was speaking her truth. It’s not her job to allow to him to keep his job. That’s management. Q: Who were the women you admired growing up? A: Martha Gellhorn, Frida Kahlo, Jane Goodall, Josephine Baker and Coco Chanel. And Amelia Earhart, because that true sense of physical bravery was very impressive to me, and the way she operated in a field that was completely male-dominated. Q: Those women succeeded on their own terms. They weren’t always easy to be around, and they weren’t always great mothers. A: Or they didn’t have children. Some of them couldn’t have children for one reason or another, and some of them chose not to. If you want to look at a more modern cohort of what I call living heroines, Ruth Bader Ginsburg and Hillary Rodham Clinton and Elizabeth Warren all have children and are present, loving mothers. Ruth Bader Ginsburg said she learned about time management from having children. Q: What do you want to give readers, besides some interesting facts about famous women? A: That women can be difficult in different, productive ways. When we think of a difficult woman we just think she’s argumentative. You don’t have to be an extrovert or outspoken. Women who are introverted or reserved are asking how they can stand up for themselves and be who they are. Look at somebody like Jane Goodall, who is very introverted and wants to sit and look at chimps in Africa for year after year and is so patient. Then she stands in front of the Cambridge dons and says chimps have personalities and they laugh at her. But she doesn’t laugh with them and go along. She says anybody who’s ever had a dog knows that animals have personalities. That ability to say what was true and not prevaricate or compromise is what makes her difficult. 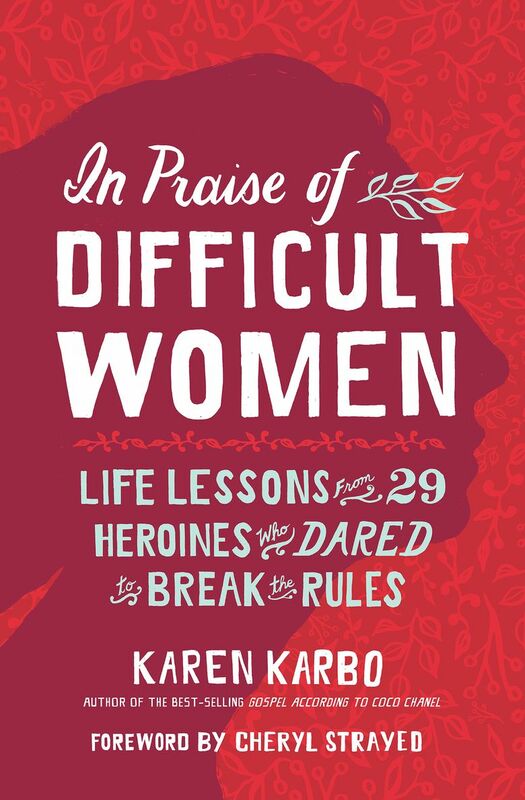 Karen Karbo, author of “In Praise of Difficult Women,” will speak in conversation with Jennie Shortridge, at 7 p.m. Tuesday, March 13, at Elliott Bay Book Company, 1521 10th Ave., Seattle (206-624-6600 or elliottbaybook.com). Jeff Baker recently reviewed “Self-Portrait with Boy” by Rachel Lyon for the Times.